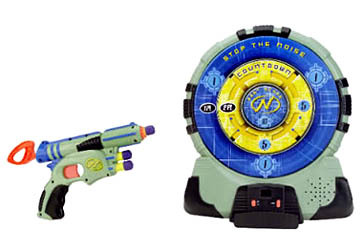 Test your aim with the Nerf Tech Target set. Three exciting electronic games for 1 or 2 players. Best Score, Countdown and Stop the Noise. Features LED score display and cool sound effects. Single-launch blaster has air pressured trigger and comfortable grip. Comes with 3 NERFdarts.